Weather: Cold. A bit of sun in the afternoon. 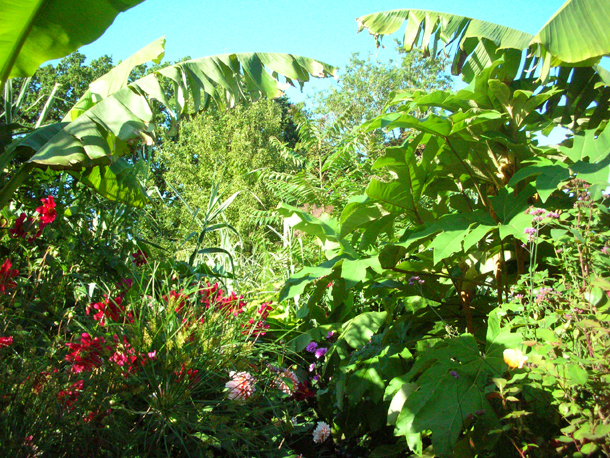 The garden is due to be open so we are giving the Exotic Garden a good tidy up. For each bed we weeded, took out the debris and cut back or trimmed things where necessary - e.g. Verbena bonariensis, Eupatorium capillifolium and an Eucalyptus gunnii. Then we systematically dug over empty patches or ruffled the soil with a tickle stick around areas that had plants in. There have been a few experiments of plants being left in the ground to see if they will survive the winter - this includes Cyperus papyrus and a Colocasia esculenta (some aided by a covering of straw). 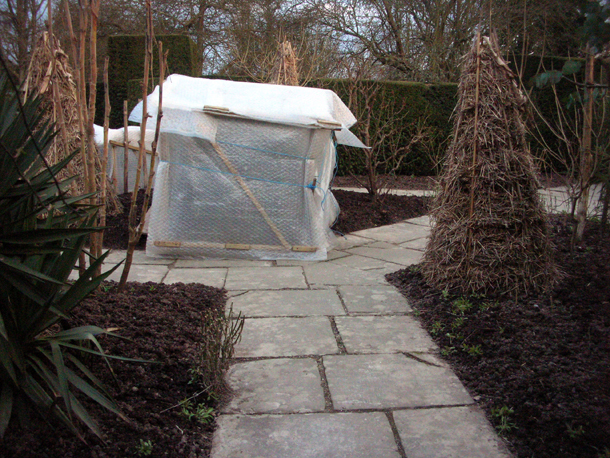 After that we spread a thin layer of mushroom compost over the bed and forked it in gently. The roses in this section of the garden have were pruned over a month ago. Weather: 3 - 4°C. Cold, but it felt a bit warmer than it has for while when the sun came out, which did so occasionally. When we came across any Mysotis in the Exotic Garden beds that was awkwardly in the middle of an area that could be dug over easily without them, then we would take them out. We had stored them up so I spent today replanting them around. Weather: Cold 3 - 4°C. Strange weather today, because different pressures keep colliding it keeps wanting to snow but not quite. It is what's been responsible for the constant cloudiness too. The sun won the wrestle though and it broke into beautiful sunshine. 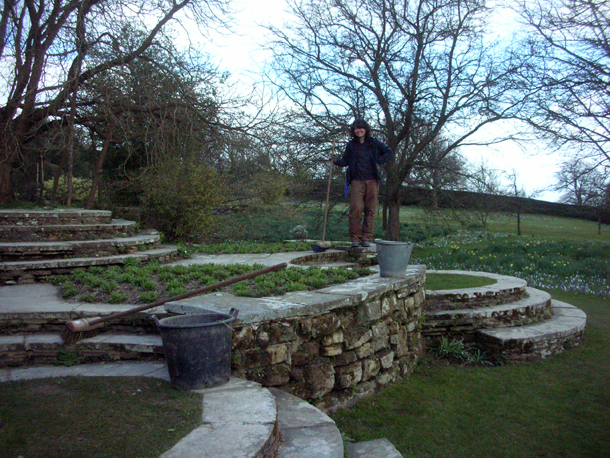 Deputy Head Gardener Siew Lee Vorley hard at work. It was the day before the first opening of the garden for the year, so it was a hustle and bustle of activities all around. Paths were thoroughly swept, I helped to spruce up the borders in the Walled Garden and around the Blue Garden to the Circular steps, and spot watered plants in our cold frames. Plant ident 27/02/2013 - Woodland & woody plants.